Double G&J Ranch: Go Cowboys!! We had plans to go to our friends house for dinner and to watch Monday night football: Cowboys vs. Eagles...however, due to the strong storms over the weekend, they were still without power. So we went out to eat and then came home to root on the Cowboys. 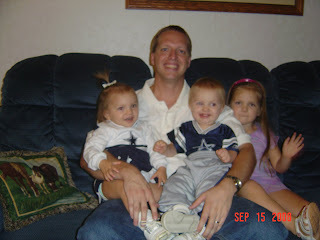 I had to get a picture of Daddy with his little cowboy fans. We had bought both of these outfits for Hope when she was little and they work perfect for the twins now. Hope was extremely disappointed that she didn't have a Cowboys outfit, so we will be working on finding her a shirt before the next game! :-) The Cowboys didn't let us down, but gave us an exciting game to watch and a win to celebrate!